There are a lot of mixed thoughts and emotions you may experience before getting your first tattoo. You may feel excited, happy, impatient, and even a little nervous. Here’s a bit of basic advice for the Warlock thinking about ink! The design is quite possibly the most important step, followed closely by where you get it done. If you’re not sure that you’re 100% happy with how the preliminary sketches look, talk to your artist about it. They can adjust the drawing and answer your questions. Read the online reviews and visit in person to check out the health standards, clientele, and tattoo artists. It’s important to make sure you’re comfortable in the shop, so do your tattoo research well ahead of time. 3. Research design ideas ahead of time. Research the design ideas you like ahead of time and come in with as much reference material necessary to deliver an articulate description of your desired tattoo. Artists will use your base description as a guideline to create a custom piece of art. If you are considering a portrait, it’s best to supply a large (preferably 8×10) clear image to work from so the detail can be captured as much as possible. Don’t be afraid to ask questions, questions, and more questions. A good tattoo artist will answer every question and take the time to make sure you’re comfortable before they start the process with you. If they don’t answer to your satisfaction, you’re just not connecting, or if they seem shady, leave. Your first tattoo is a special experience in and of itself. You may not want to choose something really huge or extremely visible (such as your face/neck/hands). It’s a big commitment and it could make it difficult to get employment, so keep that in mind. 6. Don’t be too thrifty. You don’t want your first tattoo to end up on “Fail Blogs.” Shop around until you get an idea of fair pricing, but it’s a great idea to choose a shop based on the artists’ skills, experience, and health standards, rather than price. Make sure price is discussed first, so there are no surprises at the end. 7. Take care of yourself physically. Don’t go to the shop drunk (impaired judgment + tattooing = bad idea), and make sure you eat a decent meal and drink lots of water beforehand. 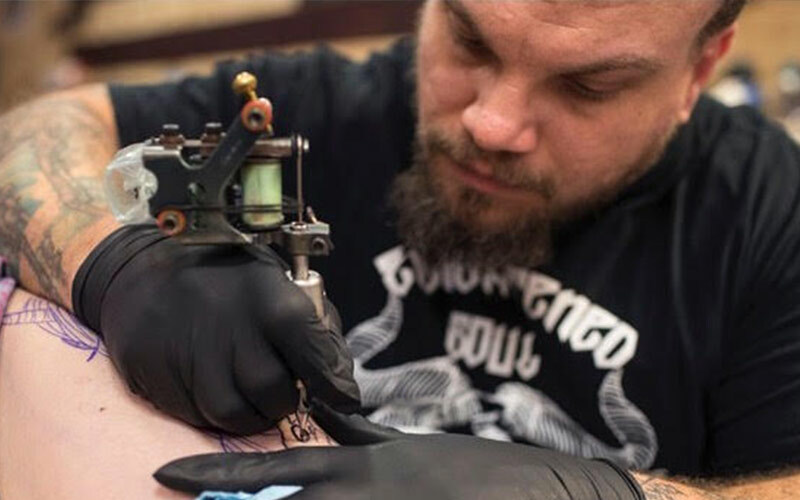 It’s going to hurt a little and you’re going to bleed a little, but it never hurts to know what you’re getting into when tattoo machines are involved. Trust that it’s worth it. And it doesn’t hurt all that bad. Depending upon where the tattoo will be, you’ll want to wear clothes that will allow easy access to that part of your body (if you’re going to get a leg tattoo, don’t wear skinny jeans). Also, if the tattoo is large, you may be there for a while, so wear something that’s comfortable. Tattoo aftercare is something you should take seriously. Healing your tattoo is just as important as the process itself, so don’t use any type of ointment but rather follow your artist’s aftercare instructions.